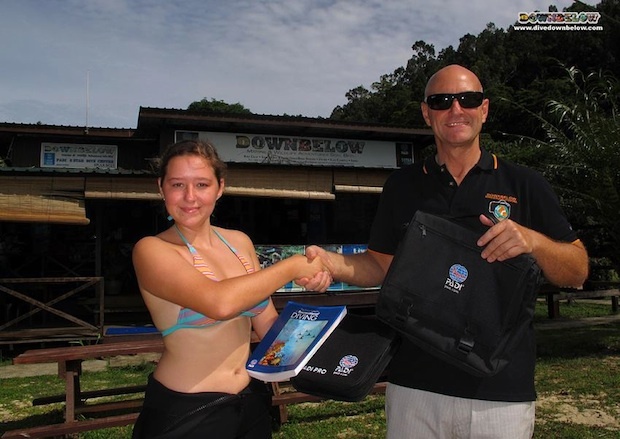 Our resident Platinum PADI Course Director Richard Swann welcomes Amy Dixon, who has decided to become a professional diver with our PADI Divemaster internship. Now that Amy has received her PADI materials, she will be introduced to various elements of a PADI Divemaster course, such as preparing logistics for a boat dive, acting as a certified assistant for a Downbelow instructor teaching any PADI program we conduct daily at our PADI 5 Star Downbelow IDC Dive Centre. One of our friendly and professional team of Staff Instructors will oversee the progress of her program and internship, this instructor will be her mentor and instructor who will be dedicated to her throughout the program which is overseen by our resident Platinum PADI Course Director Richard. Don’t worry about your schedule, Amy! Just enjoy your time with us! Our Downbelow team will get you ready to Go PRO in 2014!